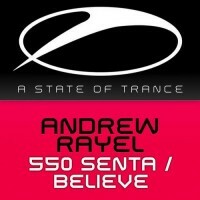 Andrew Rayel tells the next story of his A State of Trance adventure. With '550 Senta' and 'Believe', the Moldavian producer captures emotion, energy and 2 future classics!After the release of 'Drapchi' and 'Deflagration', trance land discovered a new, young talent, able to captivate the senses and honor the classic sound of trance. Each piece of his music is a piece of emotion, and the same goes for the follow-up E.P.. '550 Senta' has a solid build-up, heart-rending melody and deep beats.